The warmest of our Pinot Noir sites, Starr Ridge delivers a unique and luscious mid-palate, and darker red fruits. The Starr Ridge Vineyard, owned by our close friends the Baker Family, is the warmest of our Pinot Noir sites. Being north of the transition where the Russian River turns west toward the Pacific Ocean, it has a more diffused nature to the fog and reaches temperatures a couple of degrees above those of our own Soul Patch vineyard most days. It's a very slight difference but added up over the 240-day growing season, it is just enough to give a unique and luscious mid-palate and darker red fruits than the other two wines. 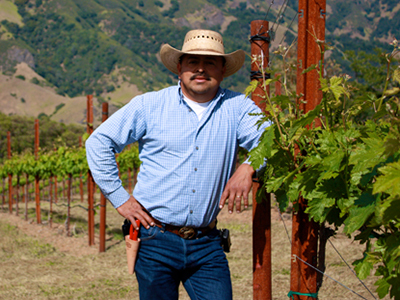 Ulises Valdez is the vineyard manager for over eight hundred acres of Northern California vineyards. He farms the Starr Ridge Vineyard for our friends, the Baker Family. 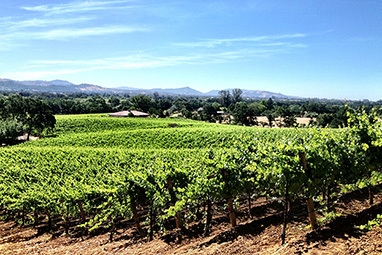 Ulises moved to Northern California at the age of 16 to learn and work the vineyards of Sonoma County. His aptitude in the vineyards was immediately apparent, enabling him to eventually build his own vineyard management company. Ulises's passion and hard work have allowed him to become one of the most widely recognized names in the California wine industry. Ulises currently owns and runs Valdez and Sons Vineyard Management and Valdez Family Winery with his wife and four children. Starr Ridge Vineyard is planted to 22 acres of Pinot Noir and Chardonnay, planted in 1996 by Gary Farrell. 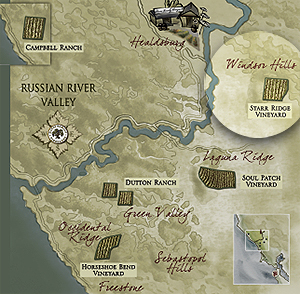 The vineyard is located on an eastern facing slope of in the Windsor Hills area of the Russian River Valley. Guy hand selects Pinot Noir from this vineyard that best highlights the specific micro-climate of the sub-appelation.